DayZ’s story is kind of unique: in the space of a few weeks (and with zero marketing) it’s gone from attracting a handful of people on a single server to becoming PC gaming’s biggest talking point, bringing in hundreds of thousands of players on hundreds of servers around the world. I asked Hall why he thought DayZ had become so popular so suddenly. He said that he thinks the game’s success was entirely down to the actions of enthusiastic players, and the stories they told others about their experience with the game. When people who enjoyed DayZ spoke about it to others they wouldn’t just say they had a good time, as they might with countless other games they’d enjoyed. Instead they would tell people – in person, on Facebook, on forums and message boards – about the time they got chased down by a bunch of bandits in a helicopter, or the time they teamed up with someone only to watch them get torn apart by zombies hours down the line. These kinds of stories, far more than simple recommendations, spurred people to try out DayZ for themselves. And Hall thinks that people don’t feel compelled to tell these kinds of stories about DayZ because it’s mechanically or aesthetically more accomplished than other games, but because it provides them with unique, emergent experiences, something that relatively few games do. It’s more interesting to tell stories about DayZ, he said, than to tell them about your latest session in Skyrim. Because even though you may have done unique things in Skyrim the overarching structure of the experience is the same for everyone. In DayZ, and in other open, emergent games Hall pointed to (such as Minecraft), your story really is your story. Hall went on to talk about what the success of DayZ said about mainstream games journalism. He noted that, while sites like Rock, Paper, Shotgun were quick to talk about the mod, the giants like IGN were far more sluggish. IGN, to take one example, took months to start talking about DayZ, ignoring it even as it became by far the most talked about game on the PC. Hall thinks that this is one of many signs indicating that what he called the ‘old model of games reviewing’ it becoming less and less relevant as time passes. As Hall sees it, games news and review websites often get into bed with developers and publishers, not because they’re corrupt or incompetent, but because this has always been the best and easiest way of getting important information quickly and reliably. But Hall thinks that now, with the rise of social media and new models of making and distributing games, this way of doing things is under threat. Big sites, used to getting all their information from the industry itself, are routinely missing important stories that are emerging through forums, Twitter, Facebook, and the like. In his developer session Hall briefly spoke about the possibility of a full commercial release of DayZ. I asked him to elaborate on this, and he told me that he’d intended to make the mod into a stand-alone game for a long time already, and had merely been waiting for the best possible offer from a publisher. 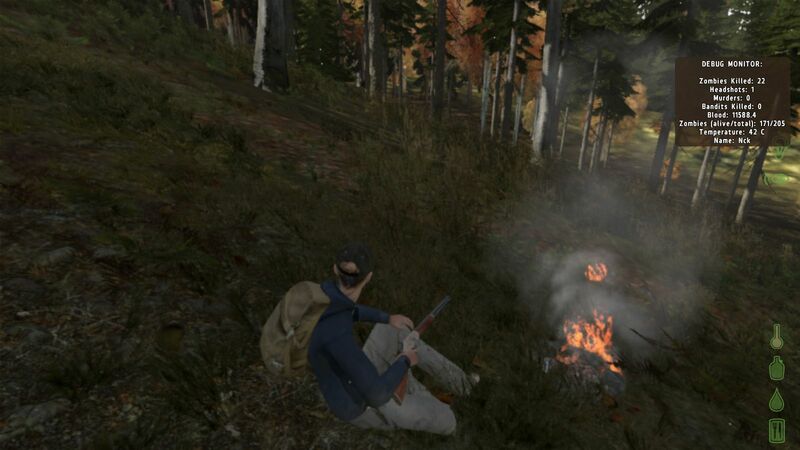 When DayZ started taking off he knew he had to be patient, and he apparently ignored several offers from eager parties who wanted to give him the money to make a full game. As DayZ’s player base steadily grew these offers became better and better, and now, after seeing the game’s popularity grow so significantly, he’s in a position where he can demand full creative control for the project from any publisher making him an offer. Hall said he wants to get a commercial release out as soon as possible. He also noted that the longer he waits the more likely it is that someone’s going to release something similar in an attempt to cannibalise DayZ’s audience. I asked him if he plans to keep the Arma II engine, and if he plans to keep Bohemia Interactive (Hall’s current employer, the company behind Arma II) involved. He said he intends to do both, reasoning that the engine is a good fit for DayZ, and that Bohemia Interactive’s involvement would be a great asset. When asked about possible business models, Hall said that while he’s toyed around with making the game free-to-play, he’s planning to take the game down the alpha funding route, in much the same way that Minecraft was released in an unfinished state and then periodically updated. He expects to have an alpha, or at least a lot of solid information about an alpha, released by Gamescom in mid-August, and he expects the game to be priced at around $15.